I added some new pages on my blog. 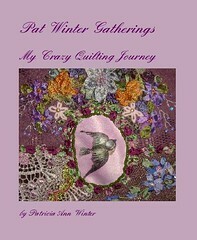 They consist of links that I always provided to the HGTV Quilting board. Last year the board was having some technical issues and I had difficulty copying and posting the list. At last, the list has been recreated and now posted to my blog. Click on the links under my header and enjoy looking at all the fun stuff. Of course I am not finished as there will be more added as time allows. If you would like a link added to the list post it here. Hi there friend! I am just hopping by to say hello and wish you a happy upcoming Easter! I am also celebrating my 2 year blogoversary so come on by and join in my giveaway! You are a special friend to me so it would mean a lot if you came on by. I haven't been doing a lot of blogging lately because I haven't been feeling at the top of my game, but hopefully I will get there someday! I still have the lovely angel you sent me in my car right where I can see it as I drive along and I still plan on blogging about it as I get feeling better! I am SO behind on blogging! I have various tutorials available on my blog http://robingallagher.blogspot.com or on my website http://www.robinquiltsetc.com. I'd be more than happy to be included. Thank you for all the great links in one place.